There was a huge crowd today for the afternoon session as Ronnie took center stage. And, just like last year, Ronnie did beat Michael Georgiou by 6-1, only it was last 32 that time. Ronnie won’t be too pleased with his performance I think, but he did the job and it’s all that matters. Ronnie looked tired ou there, but he will have a day off before meeting Matt Selt or Michael White in the last 32. Five-time winner Ronnie O’Sullivan eased into the third round of the UK Championship with a 6-1 victory over world number 73 Michael Georgiou. O’Sullivan knocked in breaks of 69 and 57 as he opened up a 4-0 lead – Cypriot Georgiou scored just one point in the opening three frames. Georgiou hit back with a 60, but world number four O’Sullivan won the next two with breaks of 68 and 82. The 41-year-old is aiming to equal Steve Davis’ record haul of six titles. O’Sullivan is also hoping to draw level with Stephen Hendry’s 18 ‘Triple Crown’ triumphs – he has won the World Championship five times and the Masters on seven occasions. 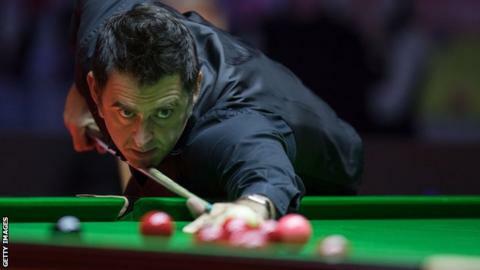 “I just want to play for the enjoyment of it,” O’Sullivan told BBC Two. “I find it tough sometimes, I just have to manage it as well as I can. He will face either Welshman Michael White or Englishman Matthew Selt in the next round on Tuesday. ‘The Rocket’ has been this season’s form player, claiming two ranking titles and reaching the final of two other invitational events. “I don’t rest on my laurels,” he added. “What’s the point of thinking like that for the next five, six months? That’s a real loser’s attitude. Such has been O’Sullivan and world number one Mark Selby’s recent dominance, the pair have claimed the last five UK, World and Masters titles. Selby, though, suffered a shock defeat by world number 66 Scott Donaldson on Saturday. I do not think O’Sullivan will be fully happy with his performance, he lost his concentration at times but he has been cueing really well over the last few months. He has done a lot of travelling this year, but has been very successful reaching the latter stages of tournaments. He is the man to beat. It was experience for Georgiou in playing one of the best players in the game out in the main arena on TV. Even though it is a baptism of fire, he can take it on to his next game but he is better than he showed today. Whatever happens from here, he’s got the right attitude. thanks again for all the reports and infos. Here – as a further addition – some links of Eurosport coverage I found on youtube. Thank you Silvry. Those were not yet available when I wrote the above. I will now include them in the Dayb5 report.